Imagine sitting in a comfortably hot 100-year-old thermal pool while snowflakes fall softly around you. That’s what we did in mid-February when we first visited Budapest. 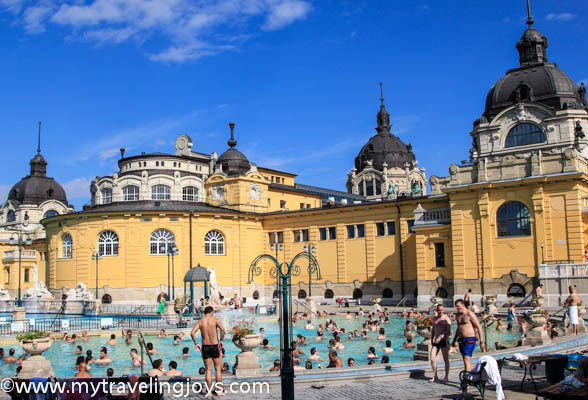 No visit to this lovely Eastern European city is complete without a stop at one of its infamous therapeutic baths, in particular at Széchenyi Thermal Baths. This bath, first built in 1913 and expanded in 1927, is one of the largest spa complexes in Europe. There are three outdoor pools, 15 indoor pools and 10 sauna/steam rooms – all with varying temperatures. Romantic and steamy is what the Széchenyi Thermal Baths looked like in February. 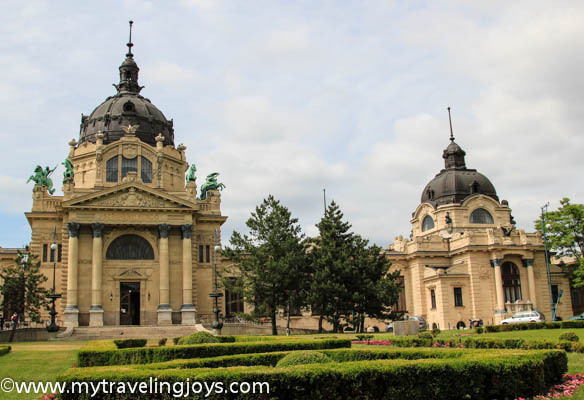 In May, we returned to Budapest and paid another visit to Széchenyi Thermal Baths for two reasons. First of all, you can’t help but enjoy yourself here. The buildings are gorgeous, built in the neo-Baroque style as much of the city itself, and the baths are relaxing and a little romantic. Secondly, we wanted to improve upon some of the first mistakes we made. 1. Rent a cabin instead of a locker. If you are a couple or with good friends, this makes the most sense as far as sharing space together. We also felt our goods were secured safely behind the automatic locked door. 2. Bring your own towels, swimsuits and flip flops. During our first visit, we forgot to bring towels and flip flops. We had to wait in a long line for 30 minutes to get towels and then were told we could pay only in cash. (Who carries cash in their swimsuit?) Towel rental costs 4500 HUF (about $20) each. Be sure to return the towels in the same long line to refund your money. OR skip the lines and bring your own Turkish beach towels which is what we did the second time. Our feet simply suffered on the cold floors. Another tip: bring a plastic bag to store your wet suits and towels in after you’re done. 3. If you rent a cabin, you will receive a plastic watch that you must scan on a small box located on the wall on the first floor. The scanner will give you the number of your cabin, which also could be located on the second floor. This was confusing at first because we didn’t know where to go and no staff was around to assist us. 4. Skip the Thai massage. We thought a couple massage by two Thai women would be relaxing, but then we both ended up being twisted into pretzels and aching afterwards. Save your money for a special dinner instead. 5. Allow at least two hours of relaxation time at the baths. Honestly, if the sun's rays were warmer, I could have stayed there all afternoon. 6. Explore. Wander around the different pools and see which ones you like best. We found the indoor ones to be a bit chilly for our liking. I guess the idea is you take a dip in the hot thermal pools and then cool off in the others. I didn’t try the sauna/steam rooms as I can only tolerate them for about 10 minutes, and one boasted temps of 60 C (140 F). Hot momma! 7. In the summer months, you can avoid long lines at the entrance by buying vouchers at the tourist information offices around the city. You also receive a 10 percent discount if you have the Budapest Card. 8. Don’t drink beer in the pools. We were able to sneak in one beer each before we saw the guards making rounds and yelling at the mainly British stag groups near us. 9. Bring your own shampoo and other toiletries as you won’t find anything here. I wanted to clean up quickly before hopping back on the metro, and I needed to dry my hair since it was little on the cooler side outside. 10. Most importantly, relax and have fun. My husband and I spent two hours lazily floating by each other and people watching. The baths were exactly what the doctor ordered! 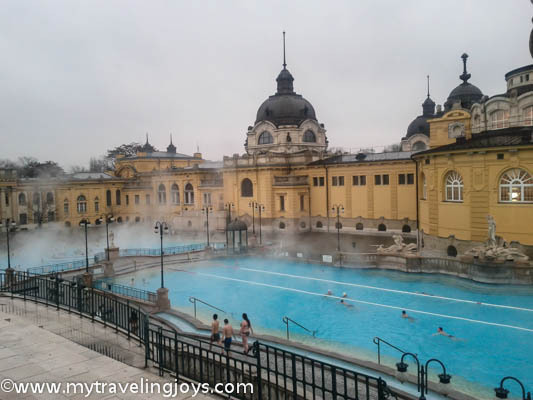 Have you been to any of the thermal baths in Budapest? Széchenyi Thermal Baths ( Take the metro to the Széchenyi stop). 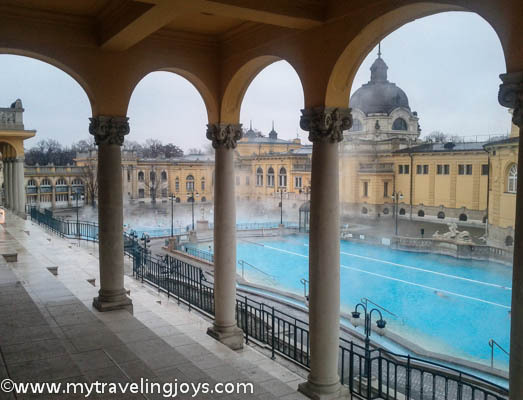 I have visited the Gellert baths and they are similar but in a smaller complex than Szechenyi - still, quite historic and relaxing. My sister and I lazed in the various pools - by the way, clothing was optional in the women's section of Gellert (this was in 2004). The communal swimming pool required a suit, of course, and a shower cap which they provided to each patron. We skipped the massage - too expensive and an unknown (shades of Tony Bourdain in Uzbekistan? - ouch) Glad you had such a wonderful time - and then, hope you "fell into" Gundel for a bite afterwards. @Mary, we might have to try Gellert next time just to compare. Looks like hubby will have more business in Budapest now and it's only an hour flight for us. Yay! @Ozlem, Cok Merci! I'm still working on the blog but it's better now. Budapest is so lovely! I really enjoyed it! wow...what an interesting place. you sure are getting around already! I'm a local in Budapest and glad to hear you enyojed the thermal baths. My favourite is Rudas Fürdő though, it is smaller, thus more intimate and is an original Turkish bath, very beautiful! @Eva, thanks for your tip! I will definitely have to try Rudas Fürdő the next time we were are in Budapest. I must compare to my other Turkish bath experiences in Istanbul! I LOVED the baths! I could have literally been there all day. One of the indoor pools had these amazing jets streams of water blasting out of the walls that converted the pool into a "merry-go-round" every half an hour :) I cannot wait to go back in the winter! I don't wanna imagine anymore, just wanted to enjoy sitting in a comfortably hot 100-year-old thermal pool while snowflakes are falling softly around me. Oh, man sounds like a wonderful relaxation place is Széchenyi thermal baths in Budapest. This is an awesome post. I am just amazed to see the picture and description. Budapest is a tremendous place for visit. The scenery is very nice. My husband and I are planning a trip over Easter. Thanks for the tips very useful!